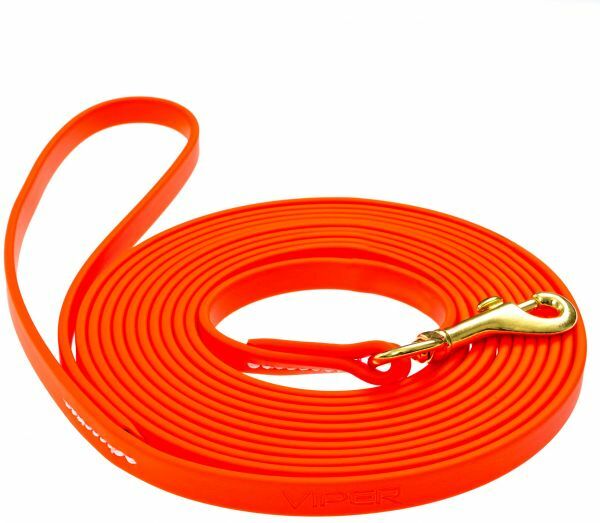 Our Biothane Working Lead is created from a high quality Biothane waterproof coated webbing. A trusted name in national sports leagues as well as international military and space organizations, Biothane has a flexible substrate core that is bonded with a durable waterproof coating for protection. Our Biothane Working Lead is created from a high quality Biothane waterproof coated webbing. A trusted name in national sports leagues as well as international military and space organizations, Biothane has a flexible substrate core that is bonded with a durable waterproof coating for protection. It is durable and cleanable, and has proven durability in applications where safety, cleanability, flexibility, and strength are crucial. This leash is fantastic. Great training leash length. Highly visible so you don't trip over it. Quality hardware. The biothane material stands up to abrasion (such as dragging on pavement and gravel), rough playing with other dogs, and wet conditions. It doesn't stretch and it doesn't retain odors like other leashes. Dirt can be quickly rinsed away or washed away with dish soap. It seems a bit heavy if you carry it and the thinner width doesn't offer good grip (not as good a grip as leather but not as painful as nylon) if your dog tries to drag you , but I leash my 60lb dog to my belt with it and we walk a few miles on pavement each day with the leash dragging between us no problem. All that abuse and it still looks brand new after 6 months. I imagine this leash will last a lifetime. I always recommend this leash to dog people. It offers a much more secure method of controlling your dog yet giving them some freedom to move independently than a retractable leash. I purchased the 3/4" 33 ft lead to train my 6 month old boxer on recall. It is very sturdy although very heavy so she would not move. I will return to try the 1/2" and hope it is lighter. You may want to keep this in mind when ordering. This leash is great, and that is coming from a die-hard leather leash person. I purchased the 3/4 x 15' for my 100lb Akita. It felt a little heavy at first, but actually it just feels like a higher quality product. The snap is made of brass and works well. The hi-vis orange helps alert others to my presence, when walking in my neighborhood. I would definitely recommend this to other large dog owners. Just consider all the germs, bacteria, pathogens, that a porous material like leather can absorb. Now think about how a handler working an active dog touches the full length of the leash over and over again. The biothane is a closed cell soft vinyl coating over a strong woven nylon strap. One pass with an antiseptic hand wipe and it's clean. I have a 2-yr-old miniature Australian Shepherd who is about 26 pounds. I purchased the 15’ leash to give him a little extra freedom when we have space and time for him to explore and frolic, but also to work on training his recall. This leash felt a bit heavy when I received it but all concerns were alleviated when I tried it out with my dog. It’s not too heavy for my him at all, and the length gives him some freedom without being too cumbersome for me to gather up since I’m inexperienced in using a longer line. I love the quality feel and ease of cleaning, plus the bright color lets others know that I do have my dog on leash as required by law. I like the sturdy buckle that attaches to my dog’s harness as well. I think my only suggestion for improvement would be to add a sturdy locking carabiner as an alternative to the buckle. I can’t wait to give it a try out on the nature trails! Strong and light, the 10 ft and 15 ft are excellent for beginning scent training and obedience. I own these in four sizes and use them all the time. I have Irish Wolfhounds ranging in weight from 124 to 185. These are sturdy and don't slide through your hands when the dogs reach the end and pull. We train in obedience and scent training with the leads and they slightly shorter 10 foot and 15 foot are excellent for beginning recalls and scent work. I highly recommend.